Raquel Pennington was courageous throughout her UFC 224 main event against UFC women’s bantamweight champion Amanda Nunes, but “The Lioness” was simply too much for the challenger, as she scored a punishing fifth-round TKO at Jeunesse Arena in Rio de Janeiro to retain her crown for the third time. A leg kick by Nunes knocked Pennington off-balance and to the canvas as the fight began, and a minute in, she repeated the feat. Nunes was keeping Pennington’s back to the fence, allowing her to lead and land almost at will. 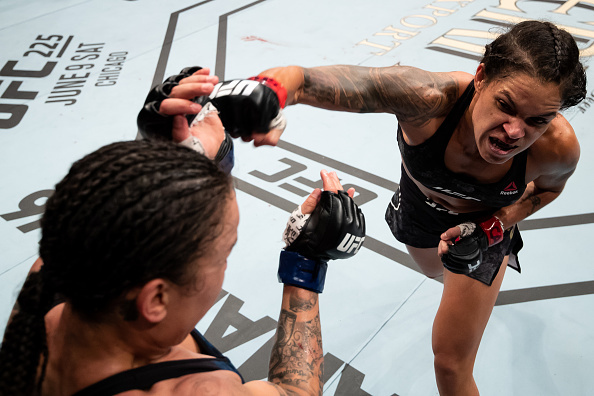 Midway through the round, Pennington rushed to the middle of the Octagon and landed her own shots, but Nunes soon pressured her back to the fence. Pennington had some success late, though, proving that she was ready for the battle to come. Nunes kept the pressure on in round two, digging to the body while also leaving Pennington’s left leg bruised up. Pennington got a takedown with under a minute left, but she wasn’t putting Nunes in any serious danger, something that needed to change if she was going to stop the champion. In the second minute of round three, Nunes scored her first takedown of the fight, but a stall in the action brought a restart from referee Marc Goddard with a little under two minutes remaining. Both fighters went back to work, but the harder shots were being landed by Nunes, whose shots were rapidly closing Pennington’s right eye. Nunes dominated the fourth behind solid clinch work punctuated by knees that appeared to break Pennington’s nose, and between rounds, the challenger told her corner she was done. The gutsy Pennington still answered the bell for the final round, but it was only a matter of time until Nunes finished the fight, and she did with a series of unanswered ground strikes that brought Goddard in to step in at the 2:36 of the fifth frame. With the win, Salvador’s Nunes moves to 16-4. Colorado Springs’ Pennington falls to 9-7.